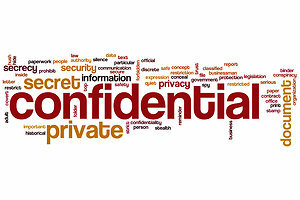 Your confidentiality is very important to me. I will not talk to anyone else about you, and what you tell me will remain between us. My aim is to create, as far as possible, a safe and trusting place where you can talk about and explore the issues in your life. There are two exceptions to this confidentiality; if I think you may be about to seriously hurt yourself or someone else, then I may want to talk to someone else about that. I will do my best to talk to you about it first, and get your agreement. The other exception is that every psychotherapist has a supervisor, who provides a 'third mind' on matters and who monitors the work being done to ensure it meets a good standard. I will discuss our meetings with my supervisor, but they will not have your name or your contact details. I will collect some contact details from you, such as your address, phone number and email address, and these will be kept safe and never disclosed to anyone else. I will occasionally take notes of our sessions to aid my memory; these will be kept confidentially and destroyed 2 years after we finish our work together. You can see these notes at any time, and if you would prefer me not to keep any records then please let me know. Finally I run workshops and therapy groups occasionally and I may email you details of them; if you would prefer not to be sent this information then please let me know. All this information will be in a written contract which I will ask you to sign when we begin our work together; if at any time you have any questions or doubts about it, I will welcome you asking me about it. In doing all of this, I am abiding by my professional organisation the United Kingdom for Counselling and Psychotherapy's Code of Practice, and the new data protection laws.